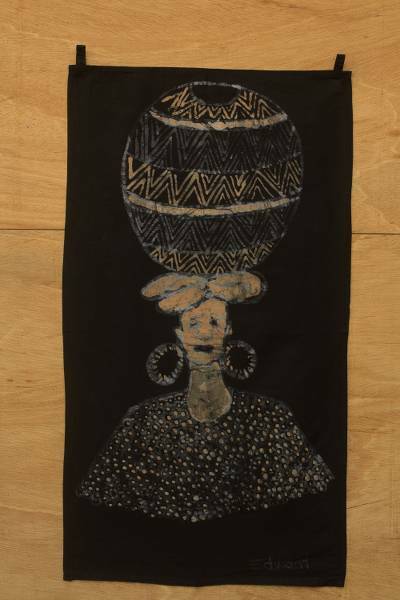 Artisan Crafted Unique Batik Wall Hanging, "Initiation into Womanhood"
Dressed in her best, a girl carries a calabash on her head. Edward Adeniran creates a batik wall hanging of radiant beauty, depicting a teen at the threshold of adulthood. "When a girl is born into kinship and she grows up, she must be initiated into womanhood by carrying the jewelry that her parents gave her to the venue of the ceremony. This is mainly practiced by the Yoruba tribe in the Western part of Nigeria," the Ghanaian artisan explains.